High places such as Gobekli Tepe and Çatalhöyük had royal temples that would have been built by the "Mighty Men of Old" (Genesis 6:4). 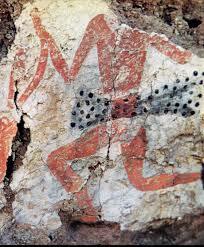 This image was found at Çatalhöyük (7000 BC). It shows a red skin priest wearing the leopard skin typical of the priests of antiquity who moved out of the Nile valley. Keep in mind that the dispersion of Y-DNA Haplogroup R1 began about 70,000 years ago, long before the time of Noah (4000-2800 BC). The T-shape pillars at Gobekli Tepe probably represent the Sun's arc from east to west. This shape is a symbol of the High God, and later enters into scripts as the mark of the High God. An example is the oldest known word for the High God among the Chinese, which is s 天 Tiān. The word also means Heaven. I suspect it is closely related to T-An, suggesting that the priests of Anu/Ani (Sumerian and Akkadian) had moved from Bactria into China much earlier than generally assumed. 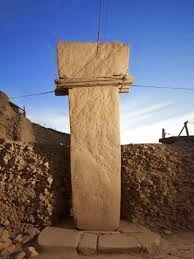 Göbekli Tepe predates the oldest temple known to have been built by Abraham's Nilo-Saharan ancestors in Sudan at Nekhen by about 3000 years. It predates the Great Pyramids of Giza by about 7000 years. It is the oldest known temple, and it remains shrouded in mystery. Göbekli Tepe is classified as a Pre-Pottery Neolithic site (PPN). 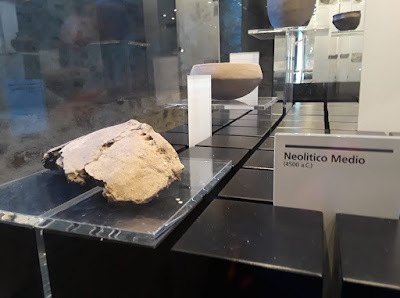 It is designated PPNA (ca 10,500 to 9,500 BC) which puts it in the same class as Jericho, Netiv Hagdud, Nahul Oren, Gesher, Dhar', Jerf al Ahmar, Chogha Golan and Abu Hureyra. This site is located in what is today Turkey. 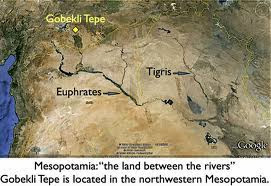 This "land between the rivers" was an ancient crossroads for peoples migrating between Africa and the ancient Near East. It is likely that priest smiths moved into the Tigris-Euphrates region and Anatolia from the Nile Valley. The Anatolian metal workers called themselves the Nes or Nas. Their language was called Nesli. Note the parallel inn the Serbian language. The Serbian word nas means us and naši means ours, one of us. Here we find the same archaic root NS. In Akkadian, "na" is a modal prefix indicating service to, affirmation, or affiliation. The name Na-Hor would then indicate a servant of Horus. I have a suspicion that Na-S refers to archaic metal workers for whom the serpent was a sacred symbol and their totem. The word Nes is associated with the rulers of the Nile. In ancient Egypt, Nesu biti referred to the ruler of a united Upper and Lower Nile. It is a characteristic of archaic peoples to designate themselves as the people, humans, or first people. Many archaic populations called themselves names that mean the People or the Humans. The natives of the Aleutian islands call themselves "Anishinabe" which means "First Men" or "Original Men." The term "Ainu" means human. The Navajo call themselves the Dene, which means humans. It is thought that the Hittites introduced iron work to Anatolia, but the term "Hittite" is an anachronism when we speak of populations as far back as 7000 BC. Abraham interacted with the Hittite clans of Het who are listed in Genesis 10. HT is the Hebrew and Arabic root for copper - nahas-het. Nahash means serpent. As an adjective it means shining bright, like burnished copper. The clans of HeT were Bronze Age copper smiths who ranged from Timna to Anatolia. The serpent image was sacred for them, just as it was for Moses and the people of Israel in the wilderness. 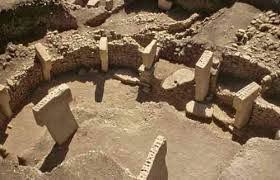 One of the mysteries that archaeologists and anthropologists hope to unravel surrounds the T-shaped monoliths that stand at the perimeter of the sacred mounds at Göbekli Tepe, of which there are about 20. The pattern resembles Stone Hedge with rings of pillars. At the center are twin pillars. The twin pillars and most of the pillars at the periphery are carved to form bas-reliefs of various animals, anthropomorphic figures, and human-animal creatures. The vulture, scorpion, horse and lion are found on the stone pillars and they appear to correspond to constellations at a time when Thuban was the pole star. 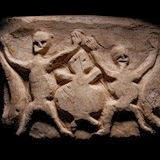 These creatures are commonly found on African images, which suggests that the structure at Gobekli Tepe may have been influenced by priests whose origins were in Africa. The vulture is an important totem among the ancient Nubians. The earliest pillars are the biggest and most sophisticated in construction and artistry. The later pillars are smaller, less intricate in design and mounted with less precision. Nate Ramsayer has made a case for the view that the stone pillars might represent individual people. As he states, "This interpretation fits well with the emerging concept of social stratification that can be seen in Anatolia during the PPN at sites like Çayönü and Neval Çori." If the T-shaped pillars represent humans, they were probably rulers, high ranked priests, or the heads of clans. It may be that clan leaders intended to have stone pillars with the clan's animal totem as a display of wealth or power. Or it may be that the 16-ton limestone pillars represent deified rulers who were venerated as ancestors. Each pillar served as the ruler's presence by which he also represented his clan, before the deity. The T shape appears to be a very ancient symbol that represented a complex of ideas including heaven, the High God, mankind, and blood. 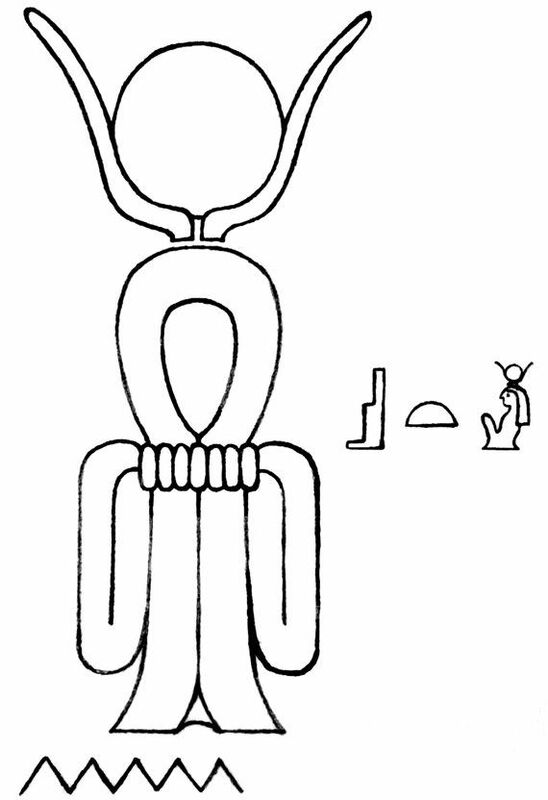 These come together in the Tyet symbol of the Old Kingdom (show above). 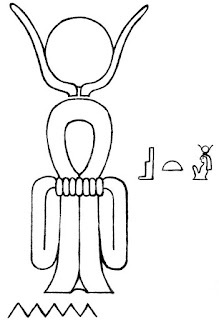 It consists of a solar orb above a human form (Hathor) and appears to be a variation of the ankh. Mystery surrounds how the huge pillars were transported from the quarry. Were hundreds of beasts of burden used? If so, why do these animals not appear on the carvings? The animals carved on the pillars include bulls, cranes, ostriches, vultures, lions, serpents and crocodiles, all animals sacred to Abraham's Nilo-Saharan ancestors. The worship of pairs of central objects in ancient sanctuaries or temples is a characteristic feature of a number of early Near Eastern cultures. Such symbolism represents the binary basis and dualism of people’s mythological perception of natural phenomena.